I am so grateful that I found Bible Mapper 3! For me, it really helps to have visual aids; and by getting more of my senses involved I retain what I am learning so much better. So when I read through the entire Tanach (Genesis through Malachi) back in 2000 I looked up, or tried to look up, every place that was mentioned. And, by doing this, I learned so much more. But my biggest problem I was finding maps that were adequate for the task. I had to use multiple maps to find what I needed and this made my task very slow. Sad to say, many of those maps were so poorly constructed that they were almost useless. But recently I found a map that did everything I needed and more. It is a free program called Bible Mapper 3 which was created by David P. Barrett. Here is a screen-shot of my Bible Mapper 3 and if you click on it you can see it at 100 percent. 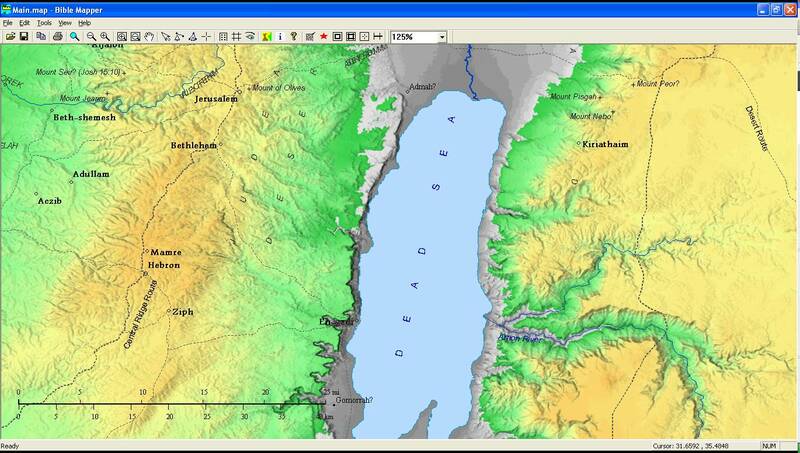 This Bible Mapper 3 program has many amazing features which are just not possible in the conventional jpeg type maps. Here are just a few of the goodies. The zoom feature allows adjustment to see just the area that is important to you at the time. You can decide which places you want to see and which places you do not. And if a place you want is not on the map you can add it. This wonderful map program can be downloaded and installed at BibleMapper 3. Every serious student of Yehovah’s word needs this free Bible Mapper 3 program and I hope you will enjoy it as much as I do. Thank you for this Michael I’m sure this will help out a lot with my studies. I am so bless by the topic destiny mapper, but I need you to help me with the scriptures. Thank you John for visiting my site tonight. My whole site is designed to help you with the scriptures and especially my sabbath class each week. 2017 e-mail address for all versions is bouncing. I did some research this am to see if I could find David Barnett and hope he is OK. But, as you said, all my emails were returned. I will take down this page once I know that you have received this reply.